Connecting the community to the food system is vitally important for the health of individuals and the survival of local farms, according to Rose Hayden-Smith, Ph.D., who is the editor of the UCFoodObserver.com, an online publication for the University of California (UC). A long-term county resident, Hayden-Smith was previously sustainable food systems initiative leader for UC’s Ag and Natural Resources division. Phil McGrath. Credit: McGrath Family Farm. The public is invited to visit more than 20 Ventura County farms, ranches and agricultural organizations for the free self-guided Ventura County Farm Day. Based on your interests, you can tour an organic farm in Ojai. Watch a goat’s milk soap demonstration in Filmore. See tomatoes being grown hydroponically in Oxnard. And that’s just a few of the fun farming activities and tours available. Museum of Ventura County’s Agriculture Museum in Santa Paula preserves and tells the story of farming in the region. It’s open 10 a.m. to 4 p.m., Wednesday through Sunday. Enjoy old photos, vintage fruit labels, postcards and other historic images? Visit the Museum of Ventura County’s Research Library with more than 40,000 images from 1864 to the present. It’s free to the public and open temporarily from 11 a.m. to 5 p.m., Wednesday through Friday. Learn how L.A.’s vibrant agricultural scene gave way to a sprawling metropolis in “LA Foodways” Chapter 3:The Paving of Paradise. Watch now. Teresa O’Connor is a food reporter, who was the assistant editor of UC Food Observer. Her articles have been published in Horticulture, Civil Eats, Yes! Magazine and other publications, including the cooperative extension services for California and Idaho. 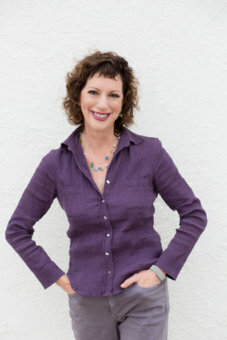 She created FarmFreshLowCarbLiving.com to educate about healthy low carbohydrate lifestyles.